Each senior must complete his online check-out no later than Wednesday, May 9, 2018. Purchase/reserve tickets for the Commencement Buffet, to be held Sunday May 13. Purchase tickets through the Wabash Bookstore. 8 am - 5 pm: Senior Art Exhibition in the Eric Dean Gallery, Fine Arts Center. Graduating senior art majors Thomas Boudreau, Taylor Canter, Joseph Dierdorf, Ross Harvey, Dominick Rivers, and Samuel Watts will display their work. Graduating senior art majors Thomas Boudreau, Taylor Canter, Joseph Dierdorf, Ross Harvey, Dominick Rivers, and Samuel Watts will display their work. Join President and Mrs. Hess for a celebration in honor of the Class of 2018 and their families. The Baccalaureate sermon will be given by Rev. Adam Fronczek ’01, Knox Church, Cincinnati, OH. A buffet lunch will be served at a cost of $15 for graduating seniors and their families. 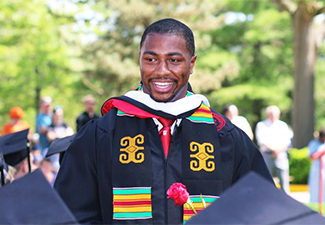 2:30 pm: 179th Commencement Ceremony on the Wabash College Mall (In the event of rain, the ceremony will be held in Chadwick Court.) Complimentary photographs will be taken of your son as he receives his diploma and will be mailed to parents after Commencement. 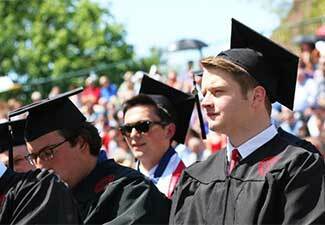 President and Mrs. Hess will host a reception in honor of the Wabash College Class of 2018. Click here to download the 2018 Commencement schedule. Click here for map of locations of various events on campus.